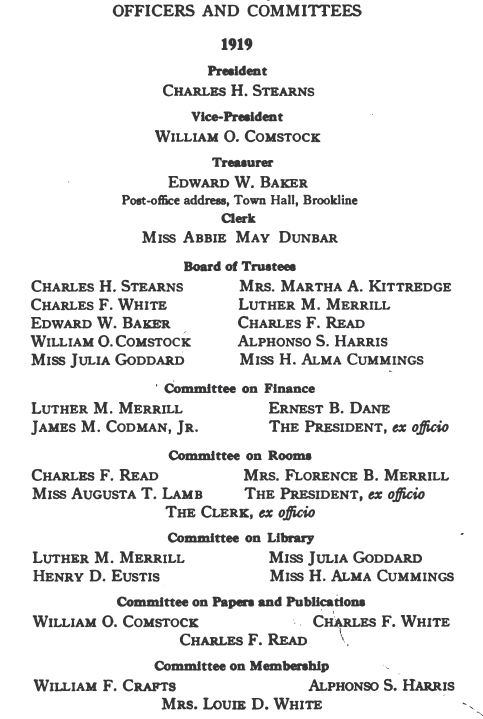 The seventeenth annual meeting of the Brookline Historical Society was held in the Edward Devotion House, Brookline, on January 24, 1918, at 8 p.rn, President Charles H. Stearns was in the chair. William E. Lincoln, although not a native of Brookline, had lived most of his life here; he was best known as the treasurer of the Brookline Savings Bank, having been identified with that institution for nearly forty years. He was also in business with his father, and later was the senior partner of William Lincoln&Son, real estate agents. He was a thoroughly reliable man, and occupied an honorable position both in the bank and in Harvard Church, which he for many years attended. He lived on Gardner Road, and left a widow and daughter. Alfred Eugene Kenrick was born and always lived in Brookline. He was connected with his father in the plumbing and heating business, and after his father's death, he continued to the last in this work. He too was greatly interested in the Savings Bank and was for years one of its faithful officers. Mr. Kenrick was one of the best known of our citizens and will be held in grateful remembrance. James M. Codman was one of our oldest citizens. Coming as a young man to Brookline, he married the daughter of Ignatius Sargent, and lived for many years on the Sargent estate. He was at one time one of our selectmen, as was his son. He was a graduate of Harvard College, and almost the last survivor of the class of 1851. Prentiss Cummings was a lawyer, a good citizen, always o ready to respond to the call of his town. He had lived in Brookline many years, and was at one time one of the directors of the West End Railroad. He was interested in astronomy, and gave a lecture on the subject in the old High School building. He was devoted to the good of the town and was always respectfully listened to in town-meeting. One of the last of his dealings with the town was his recommendation to buy land on Corey Hill that insured the continuance of a lovely view. He had a fine home on Gardner Road. Clarence H. Esty came to Brookline about twenty-five years ago from Ithaca, N. Y., and built the large house on the summit of Aspinwall Hill. He was a graduate of Cornell University, and always continued his interest in his native town. Mr. Esty, on land opposite his house, set out trees, making a park, thus doing his bit to beautify the town. William Craig had lived in Brookline about twenty years. He was senior partner in the firm of Winn&Ricker in Faneuil Hall market, and was at one time chairman of the selectmen of the town. Mr. Craig had a happy disposition, and one of his frequent sayings was "Cheer up." He has left a happy memory. We have had eight meetings during the year: four in the Devotion House, one in the hall of the Devotion School, at the meeting of the "Bay State Historical League," one in the hall of the Public Library, one in the Grand Army Hall, and one in the First Parish Church, in celebration of the two-hundredth anniversary of the First Parish in Brookline. January 24. At the annual meeting the election of officers took place, and the reading of the president's report of the work of the year. February 24. On this occasion our society entertained the Bay State Historical League, a group of the historical societies of the state, in the hall of the Devotion School. 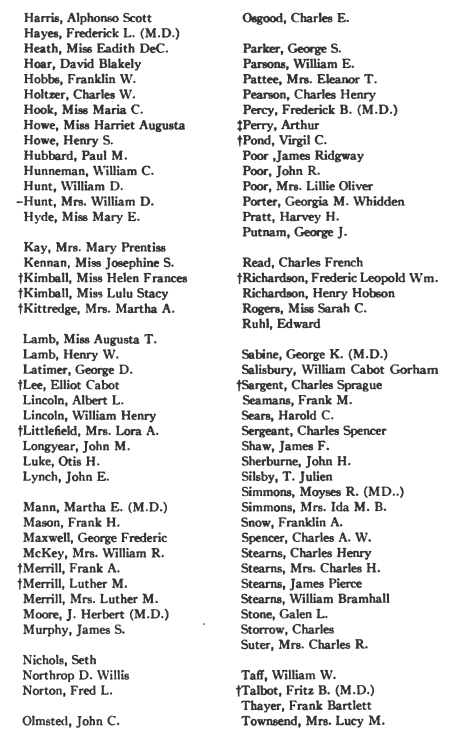 The meeting was held in the afternoon, and consisted of an address by Frank Smith, president of the league, an address of welcome by the president of this society, a paper by Edward W. Baker, our treasurer, giving some account of Edward Devotion and the school fund which he left, a report by Nathaniel T. Kidder of Milton, vice-president of the league, and a scholarly paper by our townsman, Marshall P. Thompson, on "Count de Rochambeau," The ladies of the society provided a lunch. March 28. In the Devotion House Charles F. White read a paper entitled "Deacon Ebenezer Davis, 1703-1775: His Family and Land Holdings in Brookline." Mr. White gave a very interesting and detailed history of this man, who occupied a high position in the town. His family and descendants were at one time quite numerous. It was a scholarly production and required much research. Mr. White himself is a descendant of the Davis family. April 26. Edward W. Baker gave us a very interesting talk about old Brookline, illustrated by lantern slides, in the hall of the Public Library. He has given much pleasure to many people with his views and by his descriptions of old Brookline. May 31. This meeting, near Memorial Day, was held in the Grand Army Room of the Town Hall. A paper entitled "Reminiscences of the Civil War by an Old Veteran," by Carl Astrom, was read. It was mostly personal experiences in the Civil War, and was most appropriate in its time and place. October 31. In the Devotion House Mr. Read read a paper written some years ago by William J. Seaver of Brookline, entitled "An Octogenarian's Rambling Recollections of Boston, 1840-1851." Mr. Seaver lived as a boy in Boston, and the paper gave a humorous account of his experiences, and a description of Boston in those early days. I t is difficult for one who traverses the Back Bay with its magnificent structures to realize that in the time Mr. Seaver wrote of, it was a marsh bounded by tide water. Mr. Seaver wrote this as a source of amusement in his declining years, and died about a year ago. November 13. 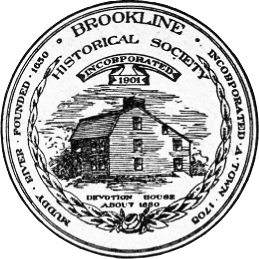 The invitation to this meeting was as follows: "The members of the Brookline Historical Society have been cordially invited by the First Parish in Brookline to join in the celebration of its two-hundredth anniversary, at the church, Walnut and Warren streets, Tuesday evening, November thirteenth, at eight o'clock." As the First Parish and the town were identical for upwards of a century, it was thought that the above celebration might fitly be the occasion of one of our meetings. As parts of this celebration, your president and treasurer contributed papers relating to the town and the Parish. The papers were well received, and a reception was held in the Parish House. Refreshments were served in Pierce Hall. December 19. In the Devotion House Mr. Walter Kendall Watkins read a paper entitled "How Massachusetts paid her Soldiers in the Past," illustrated by ancient papers and specimens of paper money. Mr. Watkins had a fund of information on the subject. The terrible war conditions are daily more and more clearly brought to our minds by the sacrifices we are called upon to make from shortages in the necessities of life. Several blocks of apartment houses near Commonwealth Avenue have been finished within the year, and several public garages have been erected. 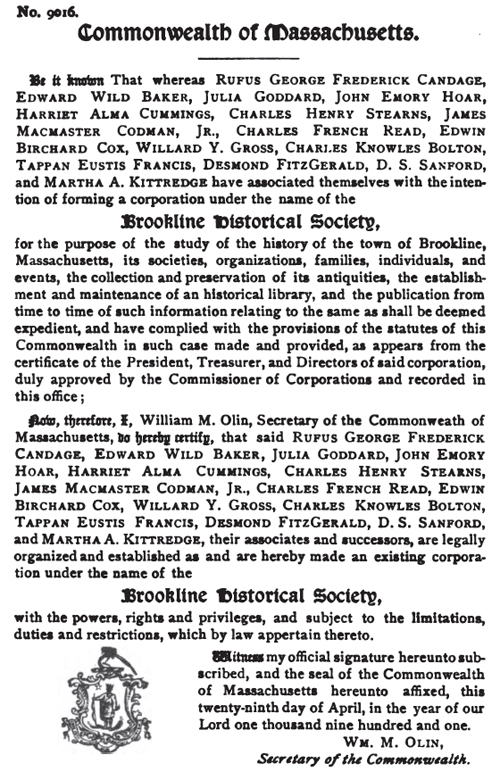 Brookline was granted the privileges of a town in 1705. Its name from the settlement of Boston till then had been "Muddy River." The land was used by the people of Boston as a pasture for their cattle and for raising crops, Boston itself being too small for farming. The town charter was granted by the General Court of the Massachusetts Colony on condition that a meeting-house and an orthodox minister be provided within three years from that date. For various reasons, chiefly because of the poverty of the little town, the building was deferred, though several attempts were made at town-meetings to make a beginning, and it was twelve years almost to the day from the signing of the charter to the ordination of the first orthodox minister, the Rev. James Allen, in 1717. The location of the first meetinghouse was on the lot just west of the parsonage, on Walnut Street, where now stands the garage of Mr. Horace H. Soule. I suggest that our society erect a memorial to mark this historical spot, for during the life of this meeting-house, and for nearly thirty years after, the town and the parish were ona.and the appropriations for both were made at the March town-meetings. It is nearly the geographical center of the town. Walnut Street was then the Sherborn Road, and Cypress Street was not built till many years later, nor Boylston and Chestnut streets. It is unfortunate that no sketch of this first meeting-house is extant, but we may be sure that in such a small community no money was wasted in adornment. We read in the annals of the town of changes in the building from time to time. In 1771 a steeple was built, and in 1782 a parsonage was erected on the next lot, the present building occupying the same site. The only relics the parish owns of this first meeting-house are the pulpit used by the Rev. Joseph Jackson, and now used as a reading desk in the present church building, and a silver communion cup given by the daughter of the first minister, the Rev. James Allen. We may have some idea of the comparative poverty and size of Brookline in its earliest days, as in 1790, eighty-five years after its charter, according to its first census, there were but five hundred and eighteen inhabitants. Early in the nineteenth century agitation began in the town for either a considerable addition to the old meeting-house or for a new one; and after much discussion and many votes at town-meeting, first to enlarge, then to rebuild, the latter course prevailed, and the present church lot of the First Parish was bought for two thousand dollars. The land was in two lots, and the new meeting-house was built on the larger one; probably the smaller parcel is the one now occupied by the first town hall, now Pierce Hall. The new meeting-house was dedicated on June 11, 1808. On a map of the town published in 1844 or 1845 is a print of this second meeting-house, and a copy of it is in Dr. Lyon's history. It merely gives an elevation of the building without any of its surroundings. It was similar to the one standing in Eliot Square, Roxbury, and to the one that was destroyed by fire a few years ago in Dorchester, and was probably built by the same contractor. It faced Walnut Street with a driveway to the entrance, and was a fine building, with a row of horse sheds on either side. The Sunday school was held in the gallery. There was no cellar, and it was literally founded on a rock. In my remembrance there were two large stoves on either side of the auditorium, with smoke pipes running the whole length of the meeting-house. It was a simple but dignified structure, but its life was only a little more than forty years. We have a relic of this building in the clock that was given by Timothy Leeds in 1806, and which now faces the pulpit. The first minister of this meeting-house was Dr. John Pierce. I knew him when I was a boy. He was the beloved minister and friend of all the town. To see him was a benediction, to know him was a joy. Strong and robust, with his long white hair, his genial smile, his wide-brimmed hat and stout cane, he was a familiar and cheering sight as he made his parish calls and visits to the schools, for he was a most active and efficient school-committee man, and in his frequent talks to the children he was full of encouragement and praise. Of his sermons I cannot report, but the memory of his genial presence and inspiring influence is still vivid and fresh. Of course my knowledge of Dr. Pierce was toward the end of his ministry. I remember well his famous address at the dedication of the second town hall in 1845, the semicentennial anniversary of his ministry or "jubilee" in 1847, and his last appearance in the then new church in 1849. At the dedication of a new organ, when he was carried into the church in his chair, after some music from the new instrument, he asked that Old Hundred, which he called the grandest tune ever written, be sung; and requested the congregation to rise, while he must be excused, as he did not belong to the rising generation. 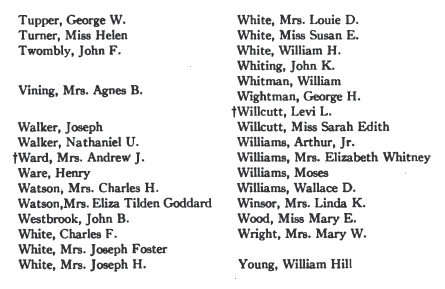 "The records of Brookline church before the ministry of Rev. Joseph Jackson were but imperfectly kept. All the proceedings of the church, which were recorded by the Rev. James Allen, the first minister, are comprised within one page. This account of baptisms is known to be incomplete, nor is it certain that he recorded all the admissions to the church during his ministry. Of marriages and deaths he left no information. This grievous neglect of pastoral duty, this strange disregard of the curiosity of succeeding generations will ever be lamented by all among us, who have the laudable desire of knowing as much as may be of the religious transactions of our ancestors. This negligence is, moreover, to be deplored, as it set an example, which was but too faithfully followed by the second and third pastors of Brookline Church." The two deacons who were in office during the greater part of Dr. Pierce's ministry were quite remarkable men, and deserve some mention here. John Robinson was a tanner and carried on the business on Washington Street. He was a man of the utmost integrity and of a more than unusually strong mind, and although a hard and diligent worker, was always ready to help his church and his town. He was moderator of town-meetings for many years, was representative to the General Court, and his name appears on the town records on many important committees. He was tall and straight, and I can see him now coming into his pew in the front part of the church, then upwards of ninety years of age. He died in 1855, six years after his beloved pastor. Deacon Joshua Clark was a farmer who lived in the house now occupied by Frederic Law Olmsted, and his farm took in what is now Dudley and Fairmount streets and a part of the old Boston Reservoir. He was not as active in town affairs as Deacon Robinson, but was a great friend of Dr. Pierce. His three daughters, all unmarried, will be remembered by the older members of our society for their great help in the church, the Sunday school, and the sewing society. Among the notable men of the parish and of the town in those days, was Charles Wild, a typical country doctor, known and respected by all; of a rather rough exterior and somewhat brusque in manner, he had a most kindly heart. His deep set eyes, under heavy eyebrows, would flash indignation at wrongs, but he could be as tender as a woman at the bedside of a patient. He was one of the Parish Committee in Dr. Pierce's and Mr. Knapp's pastorates, and was most helpful to his pastors and the parish. His son, Dr. Edward Wild, was of an impulsive and vigorous nature, and left his studies at the time of the Crimean War, to offer his services as surgeon at the battle-front; then a few quiet years at home practicing his profession, followed by our Civil War. Here was an opportunity for his courage and enthusiasm; he raised a company, mostly from our town, and went to the front as captain of Company A, First Massachusetts Regiment. He was promoted from time to time and came back at the end of the war as Brigadier-General Wild. His portrait, with its empty sleeve, hangs in the vestibule of our Public Library. He was quite musical, and in his younger days belonged to a band, which he christened "The Hypnophonians," or sleep-destroyers. Soon after his "jubilee," Dr. Pierce was urged to take an assistant or colleague, and in October, 1847, Mr. Frederick N. Knapp, a recent graduate of the Harvard Divinity School, was ordained; a pleasant play on words was the toast given at a banquet following the occasion, "that Dr. Pierce after fifty years of preaching had now taken a nap." Mr. Knapp was a singularly loveable man, most spiritually minded, and was almost as a son to Dr. Pierce in his old age. There is a familiar saying that "history repeats itself"; and have we not an exemplification of this, when seventy years later Dr. Lyon took for his colleague and devoted friend our revered pastor, Rev. Abbot Peterson? Mr. Knapp endeared himself to his people, especially the younger part of the parish. He had a rare and sweet personality. He was not physically strong, and at the beginning of his ministry objected to the size of the meeting-house and its high pulpit, which required vigorous lungs. On account of the rather crude method of heating, and perhaps other reasons which the younger people knew not of, a new meeting-house was decided upon. This was built from plans designed for stone, but for economy it was built of wood. This building, which was familiar to many of us, faced the east with the main part parallel with Walnut Street, and a vestry in the rear. The steep and toilsome path from the street to the front door will be well remembered. The row of horse sheds above the church was taken away, and the driveway back of the church made the remaining sheds less conspicuous. Mr. Knapp's health, however, did not improve, and in 1855, eight years after his settlement here, he resigned, and our society for the first time in fifty-nine years was without a minister. Mr. Knapp a few years later, during the Civil War, was appointed one of the agents of the Sanitary Commission, established largely through the efforts of his cousin, Dr. Henry W. Bellows, and he rendered most efficient service in this wonderful help to the soldiers. A successor to Mr. Knapp was soon found in Dr. Frederic H. Hedge, who was called from his pulpit in Providence and began his labors here in October, 1856. After Dr. Lyon's full account of Dr. Hedge's pastorate, it would be presumptuous in me to speak of him, except to add my tribute of respect and veneration to his memory. His connection, through marriage, with Dr. Pierce gave him a familiarity with the parish and its members, and we are now blessed with the presence of two of his children. As evidence of Dr. Hedge's popularity and the increase to our congregation, soon after his settlement an addition to the meeting-house was made of two transepts of about twenty-two pews. It is rather singular that whereas in the present day the summer season is the time for the smallest congregations, so much so that the church is closed for two months, in Dr. Hedge's time, we had our largest numbers in that season. This was largely on account of the summer residents. Dr. Hedge was our pastor throughout the Civil War, and his patriotic utterances were frequent and inspiring. As in Dr. Pierce's pastorate there were two notable deacons, so in Dr. Hedge's day, citizens of high worth and character were chosen to that office, Deacons Abijah Goddard and Benjamin B. Davis. Deacon Goddard lived into the time of Dr. Lyon's pastorate, and died at the age of ninety-six. He had served the town in the legislature, as a selectman, and in other offices. He was a strong temperance man, advocating total abstinence at a time when it was not popular. He was a farmer and it was the custom to give liquor to the hired men, especially in haying time, but Mr. Goddard refused to do this, though substituting some other beverage. Deacon Davis had not so strong a personality, though a man of most kindly disposition. He was extremely fond of music and led the volunteer choir for many years in the old meetinghouse. He was a member of the Handel and Haydn Society, and died in 1878. Rev. Howard N. Brown, Dr. Hedge's successor, came to us almost directly from the Harvard Divinity School, having preached for a few months in the town of Ilion, N. Y. He soon proved his worth, and we all know his high standing in the denomination. As he is still in the full strength of his manhood, it were unbecoming in me to say more of his ministry among us than that he has endeared himself not only to his former parishioners, but to the whole community. And his exquisite and loving tribute to the memory of his friend, Dr. Lyon, last Sunday attests his unfailing powers. Toward the close of Dr. Brown's ministry it was felt that we should have·a new church. There was opposition, but a large subscription was raised, and our present beautiful church was built. While the building was in process our services were held in the Bethany building, by the kindness of Harvard Church, and many of us recall with pleasure our months of meeting there. The third meeting-house on this spot has another frontage, to the west. It was dedicated April 19, 1893. Dr. Brown preached two years in the new church, and in the spring of 1895 he received a call from King's Chapel, Boston, leaving us in September of that year, greatly to the sorrow of all his parish. Those who have had the pleasure of reading his delightful paper, given before the Ladies' Alliance, entitled, "The First Parish in My Day," can form a good idea of the pleasant relations between pastor and people. And now another era begins. Rev. 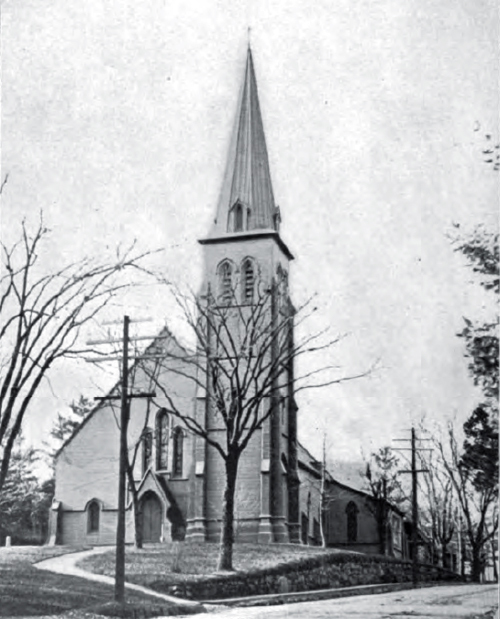 William H. Lyon, who for twenty years had been the minister of All Souls Church in Roxbury, was called to our parish, and was installed May 8,1896. Dr. Lyon was no stranger to many of us, who remembered him as superintendent of our Sunday school when a divinity student, and he began his labors here under the pleasantest auspices. 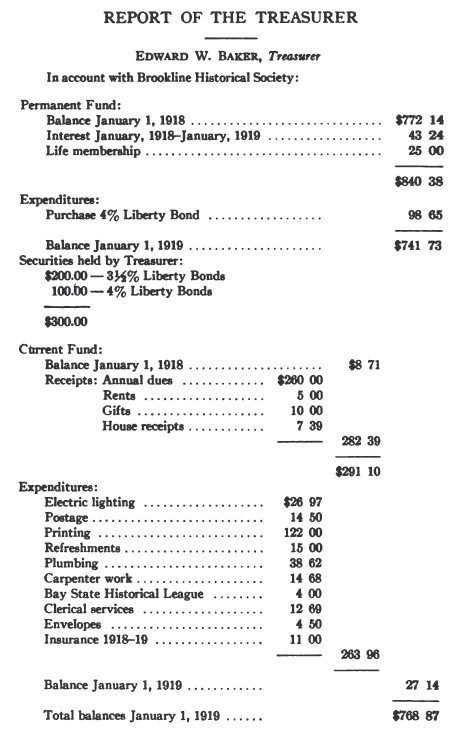 His energy, which had prompted the building of a new church for the Roxbury Society, was early in his ministry here instrumental in the effort to pay off the large debt which we had incurred in the building of our meeting-house, and thanks to his and to our own labors we were enabled to cancel the heavy mortgage. Then followed the building of our present parish house, and the remodeling of Pierce Hall. This had been practically finished and about ready for occupancy, when early one winter morning a fire consumed not only the parish house, but spread into the meeting-house and destroyed quite a portion of it. Many of us will remember the day of gloom when we gathered together that cold, icy morning and bewailed our loss. Happily Pierce Hall was spared to us, and during the rebuilding of the parish house and repairing of the church, services and Sunday school were held there. We were fortunate that the insurance on the buildings largely covered the cost of rebuilding. A change of material from wood and mastic to stone gave us a complete stone edifice of church, parish house, and hall, and it would be difficult to find a more beautiful and harmonious combination of buildings and landscape arrangement, of shrubs and turf with the background of hill and woods. Surely we had been tried as with fire and came out purified. 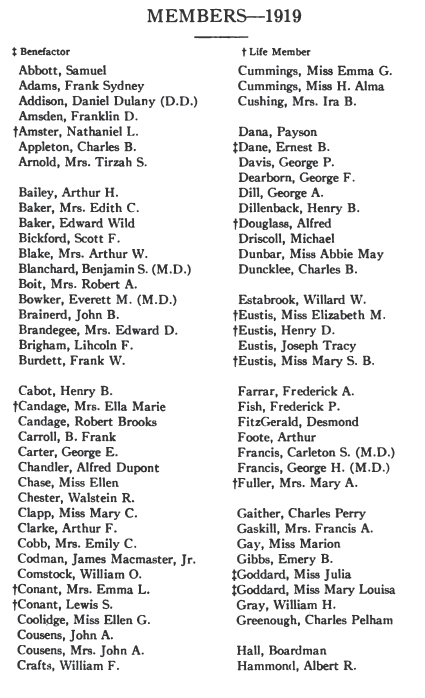 As mention has been made of some of the deacons of the church of a former time, it is fitting that tribute should be paid to the memory of three men who have held that office in recent years, and who have passed on to another world, Frank Eliot Sweetser, George Frederick Arnold, and William Sewall Cutler. Two of these have their memorials in the church they loved, one in a beautiful window, and the other in a bronze tablet. Mr. Sweetser came to Brookline in 1897 and died in 1905. He was a former neighbor in Boston of Dr. Lyon, and was his friend and neighbor here. Mr. Arnold was a dear friend of both Dr. Brown and Dr. Lyon, and this church and parish know his sterling worth.. Mr. Cutler had been many years connected with the parish. He was a most practical man, and the parish is greatly indebted to him in supervising the work of building the new parish house and the enlarging of Pierce Hall. They were all true types of Christian gentlemen. Dr. Lyon throughout all our troubles of fire and rebuilding was the consoler and inspirer, and the result was largely brought about by his courage and wisdom. After a few happy years he was suddenly taken from us in the midst of his work. Apparently foreseeing the possible failure of his strength, he had asked for a colleague, and what a pleasant combination of youthful vigor and declining years was the result! Dr. Lyon's death and Mr. Peterson's taking up the work are too recent for rehearsing here; but may we not feel that after two hundred years of existence as a church, with such a leader and with such beautiful and commodious surroundings, we shall continue a power for good in the community for many a year, and verify our title as First Parish in Brookline! It has certainly been a wonderful experience and privilege to have known and enjoyed the friendship of six of the ministers of this ancient parish in one's lifetime.